Fri Aug 28, 2009 1:56 pm by Chris R.
hey guys, im on vacation, so i won't be online much. Thu Aug 13, 2009 2:41 pm by Chris R.
Please donate if you can, if we can make credits onto the forum, i could get a google ad, so we can start to find people with our ads. also, we could get a domain name, and much more. So please, people, donate. its really helpful to the community. Wed Aug 12, 2009 4:04 am by Chris R.
Hello, 2 members that joined this site . Please, tell people about the site, we'll need more members. 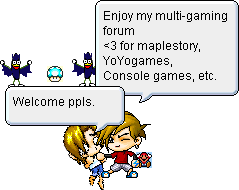 Everyone is welcome except anyone with the screen name Sinister96 ._. .